On Saturday, October 10, the Grateful Web proudly welcomes the David Nelson Band and Moonalice to the WOW Hall. 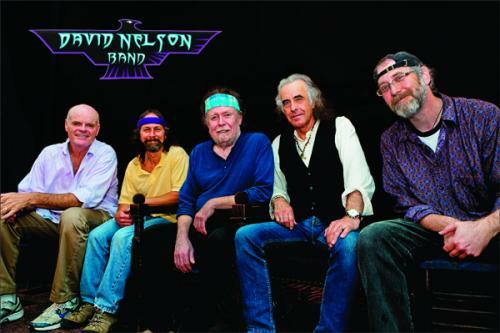 The David Nelson Band has been recording and performing aroundthe country since 1994. Their broad musical palette spans the Almost Acoustic style that Nelson played with Jerry Garcia, through roots rock n’ roll, and psychedelic country-rock. The DNB perform David's compositions (some co-written with Grateful Dead lyricist Robert Hunter), select covers, and several Grateful Dead classics upon which Nelson appeared on the original album releases. These stylistic elements, combined with plenty of spontaneous free form improvisation, create a sound that is uniquely David Nelson Band. Though the original songs are mostly written by Nelson, the development of all the material is a fully collaborative effort. The Nelson, Sless, Siegel, Sears, Molo Band as a name is a bit cumbersome -- though in reality, that’s what they are. These days the DNB only tour select areas a few times a year, as the individual band members are in high demand with other successful touring acts. Their loyal and enthusiastic fans relish these special times to reunite at Nelson family gatherings. DNB shows are a joyous reunion for all -- a communal gathering where regulars and newcomers all feel part of an extended family. Each show, being unique and exploratory in nature, is a magical adventure for band and audience alike. It's one of the reasons why many of the fans follow the band to every show, including their annual Hawaii Tour (which draws many mainland fans as well as islanders for the week to ten day island party). David Nelson - guitar/ vocals - is a founding member of the New Riders of the Purple Sage and long time musical partner of Jerry Garcia’s dating back to 1962 in the pre-Grateful Dead bluegrass band, The Wildwood Boys. Nelson was also a member of the Jerry Garcia Acoustic Band and performed on three Grateful Dead albums - Aoxomoxoa, Workingman’s Dead and American Beauty - playing the character-laden electric guitar solo on “Box of Rain”. Nelson has also performed as a member of Phil Lesh and Friends. Barry Sless - lead guitar/ pedal steel - has been a frequent member of Phil Lesh and Friends lineups since 2004. He tours currently with Moonalice and has toured as a member of Kingfish, Cowboy Jazz, the Rowan Brothers, and Great American Taxi. Mookie Siegel - keyboards/ accordion/ vocals - has toured with Bob Weir’s Ratdog, Phil Lesh and Friends, Kingfish and Donna Jean and the Tricksters. Pete Sears - bass/ vocals - was the bassist and keyboard player for the original Jefferson Starship from 1974-1987, keyboardist for Hot Tuna from 1992 to 2001 and currently performs with Moonalice. Pete has played with Phil Lesh and Friends and appears on their 1999 release, Love Will See You Thru. Pete began his career in England in 1964 and has performed with many artists including Jerry Garcia, John Cipollina, and appears on Rod Stewart’s classic early British albums. John Molo - drums - was part of almost every Phil Lesh and Friends lineup from 1999 - 2009. When the Grateful Dead reformed (after Jerry Garcia’s death) as the The Other Ones in 1998, John was a member. He has won a Grammy award for his work as a member of Bruce Hornsby and the Range, who he performed with from 1986 – 1999. He has also toured with Creedence Clearwater Revival founder John Fogerty and currently tours with Moonalice. Moonalice is a psychedelic, roots-rock band of seasoned musicians mixing a variety of genres with extended musical improvisations that evoke a sense of adventure and exploration. Everyone is a part of the experience and the music inspires dancing and other acts of self-expression. Every show has an original art poster created by a well-known artist memorializing that event and given to all attendees…each poster has its own Moonalice legend. All concerts are broadcasted live in HD and available in archive shortly after their set. Moonalice plays mostly original material mixed with several covers, and during their extended freeform jams the band moves as one, drawing from many musical genres honed from years of experience playing with various major acts. Their single "It's 4:20 Somewhere" has been downloaded over 5 million times. Their extensive tour schedule and videos of every Moonalice show can be seen at moonalice.com and every show poster with legends can be viewed at moonaliceposters.com. Tickets are $25 in in advance. Doors open at 7:00 pm and showtime is 8:00.